Entering the World of Fashion may seem like a distant, glittering dream but with Lakmé Fashion Week Summer/Resort 2013 on the horizon, now is an incredible opportunity to walk the ramp at the latest edition of the iconic event. If you’ve got the looks and you’ve got the walk, then this is your ultimate opportunity to mix it with some of the best international and national models in the fashion business. LFW has always believed in hunting for emerging talent and showcasing it with style. This Summer/Resort 2013, LFW yet again looks for fresh faces. Disclaimer: Please note that this is a PR post and the content has been sent through PR agencies. Change in venue and schedule details is not the blog's responsibility. 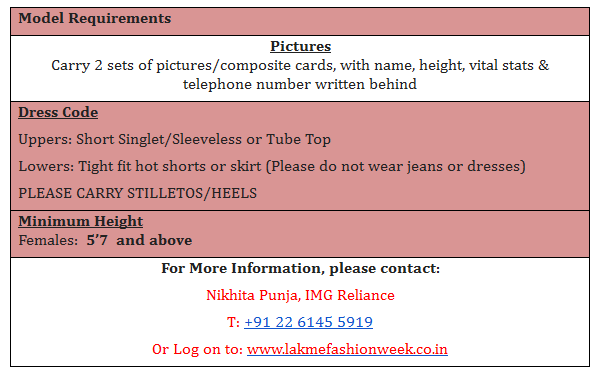 For further clarifications please get in touch with Nikhita Punja as above. The blog does not take any resposibility for the correctness of the details in the content. I love your blog.. very nice colors & theme. Did you make this website yourself or did you hire someone to do it for you? Plz reply as I'm looking to create my own blog and would like to find out where u got this from. many thanks. nice blog on fashion week of Latest Indian Fashion. thanks for sharing this information with us. Good blog post. Nice and simple.